"25%-Off Mountain House Sale" Starts at Midnight! It has been a while since our last Mountain House sale, so we are rarin' to go on this one. Starting at midnight tonight, all our U.S. listing MH can prices will discount at the maximum-allowed 25%! This sale lasts only for two weeks, so look at your situation and resolve to get into an improved position, readiness-wise. It doesn't get any better than Mountain House freeze-dried food in cans, with a shelf life of 25+ years. Well, maybe it does get a bit better when you can add in some member rewards with qualifying purchases ... like a new 9-tray Excalibur Dehydrator and a QUEST Mission Rig. Buyers tip--those who make their purchases early on in these sales, get their food shipped promptly. Those who wait till the end of the sale will often find that their order processing times by the factory may be more than a couple of weeks. Our sale orders tend to tax the factory and create a bit of a backlog of orders for them to work through. Stock up and sleep well. We've recently stepped up our involvement in a few more survival-related websites out there. Several months ago, The Weather Channel got a hold on one of our builder's saferooms for some heavy-duty abuse in the name of TV drama. It was actually pretty cool stuff. At long last, the new program debuts January 24 on The Weather Channel. It's called "Weather Proof." the ground as it is normally done. 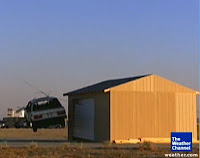 The show's producers acquired a rocket car and anchored that to the ground several yards away. The afterburners were fired up and produced a blast of wind exceeding 300mph. Boom! 2. Then, a garage was built up around the saferoom. 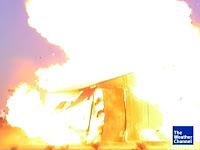 In an effort to simulate a worst-case scenario, a car was hurled into and through the front of the garage, into the side of the saferoom, igniting a natural-gas explosion and fire. Boom! After all was said and done, the total damage to the saferoom, which is constructed the same as our shelters and saferooms--a few scorch marks on the outside of the shelter from the explosion and fire. And, here's a link to some of our videos, to include a tour of a nice 700 sq. ft. NBC fallout shelter. December was the worst month for U.S. unemployment since the "Great Recession" began. Must read article by Ambrose Evans-Pritchard. Acknowledging that circumstances must ultimately dictate our response to a pending disaster or crisis, we ask this general question. Most, if not all who are involved in preparedness have in mind a "fight or flight," bugout or hunker down, Plan A or Plan B in mind for most forseeable disasters. What is your Plan A for most disasters you see as reasonably possible where you live and work? Will you grab your bugout bag and hit the highway for the hinterlands? Or are you prepared to (and hope to) fight it out at home? Please briefly explain your reasoning for what your Plan A entails. I am posting their responses here on this thread as I receive them. For the next two weeks, we're going to try something new. We're going to "open up the lines" to see if there's something we or our resident experts can do to help you address some of your more challenging preparedness-related issues. Safecastle's Board of Advisors is made up of experts in a variety of preparedness-related fields, to include medicine, emergency & disaster response, alternative energy, military intelligence, Second Amendment/gun rights/law, wilderness survival, hand-to-hand combat/self-defense, amateur radio, and more. Our experts have agreed to entertain questions related to preparedness in order to help our freinds with specific challenges in their efforts to prepare for an uncertain future. For more info on our Board of Advisors, simply go to any page in our store--www.prepared.pro. Advisor bios are linked at the bottom of the left column on each page. One, you can email me directly with your questions. Two, you can use this Safecastle subforum thread at The Survival Podcast Forum. Please allow for responses to take as long as several days, as these folks are very busy. And another eye-glistener from Adkins: "Arlington." Safecastle is starting off 2010 with an offer that is definitely a "ten"! Oregon Freeze Dry just notified us that they want to clear out their 2008 surplus cooked gulf shrimp and surplus whole boneless pork chops. As you know, MH freeze dried food is good for 25-30 years and more on the shelf. So only while supplies last (or till January 31, whichever comes first) we are presenting you with this very nice opportunity to upgrade your food-storage larder. By the case (six #10 cans), these 2008 whole boneless pork chops are buyers-club member-sale-priced at $192.00! Each can is one pound, four ounces of freeze-dried pork chops. Re-hydrated, you can expect 3 pounds, 12 ounces of delicious fresh-boned chops out of each can. Remember, this sale is by the case, so for that price, you get six cans. By the CAN (to make this delicacy more attainable), these 2008 cans of cooked gulf shrimp are simply as good as it gets for fine Armageddon dining. Member-sale-price is $60 per CAN. Each can is 8.8 ounces before hydration--over 150 shrimp per can! Free shipping, as always, to the lower 48! Safecastle is here to serve! Please let me know if you ever have any questions, suggestions, or concerns. Labels: Crystal ball, Cultural realities, Political realities, Why prepare? Download it, read it, share it. Did I mention that it's FREE? And don't forget to visit his survivalist blog to say thank you. Labels: Cultural realities, How to be ready, Why prepare?